Upstairs we find the fossils. This may look like a pretty normal horse, but if you look at the feet you'll notice each foot has a few extra toes. This does occur occasionally in modern horses (Alexander the Great's horse, Bucephalus, was said to be a five-toed horse and would only allow Alexander as a rider) but it was normal in this species. Speaking of weird toes, what is this thing? It turns out it is a Chalicotherium, a hoofed mammal with a face like a horse, which walked on its knuckles like a gorilla in order to protect its long hooves, which it used to snag branches of tall trees and bring the leaves to its mouth. 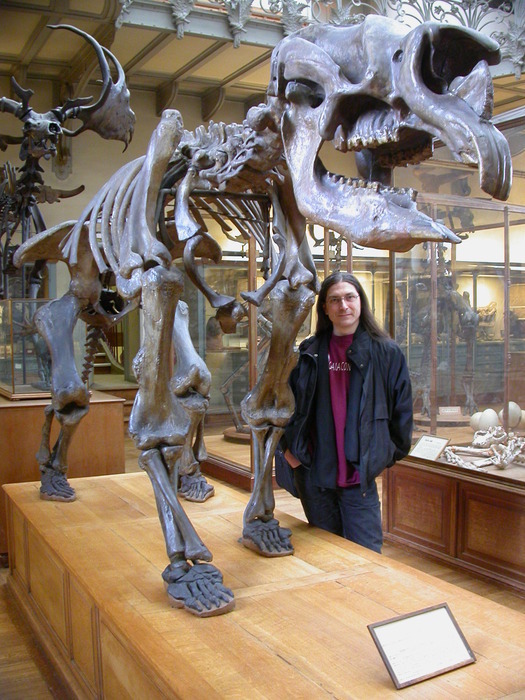 Eric next to a Megatherium, or giant sloth. 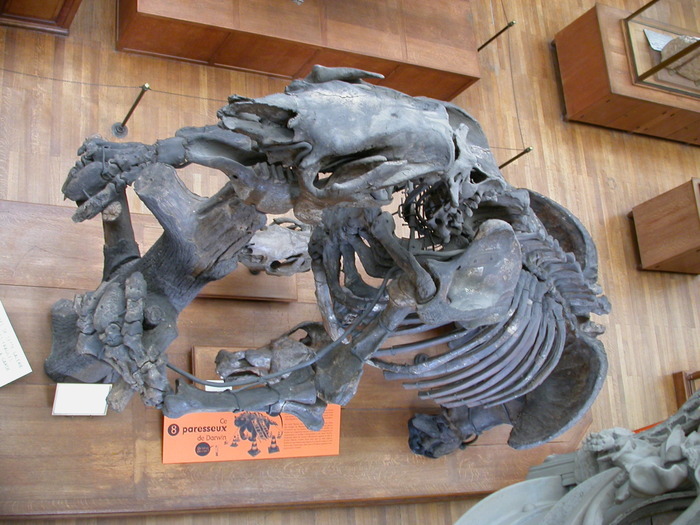 This long-lost relative of our modern sloths weight as much as an elephant, and was capable of reaching 17 feet into the air. Remember the elephant from downstairs? 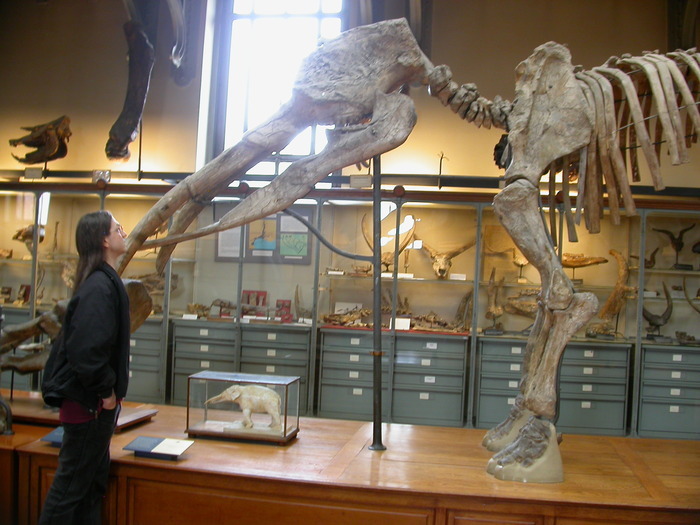 This is a mammoth. Note the difference in size. 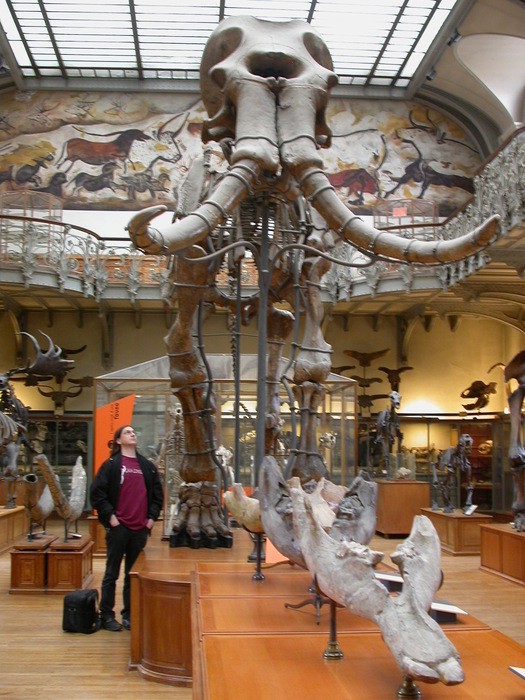 Another extinct elephant, probably a gomphothere. Note that this guy's tusks are quite different, and that he is equipped with tusks on the lower jaw as well. 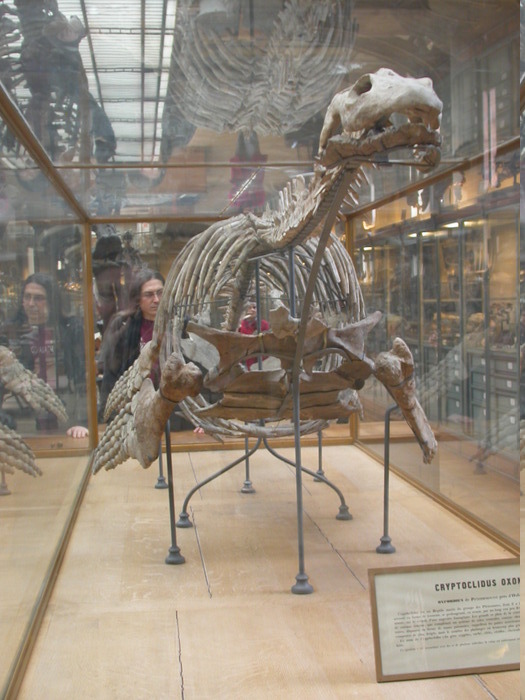 Note also how similar the skull is in shape to the whales downstairs. Another variation on the elephant theme, a Moeritherium. Note that this one still has some separate teeth, while our modern elephants have fused teeth with only 4 teeth in use at any time (apart from the tusks, which are elongated incisors). Modern elephants have 6 sets of molars which they grow and lose in their lifetime, in much the same way as we have baby teeth and adult teeth. As the new molar grows, the old one is pushed forward and its roots are slowly absorbed. At the same time the crown is being ground down from use. By the time the new molar is in place, the old one is a thin shelf which falls out. Many elephants die when the 6th molar wears down too far to eat, but a small percentage of elephants will grow a 7th molar at the end of their life. 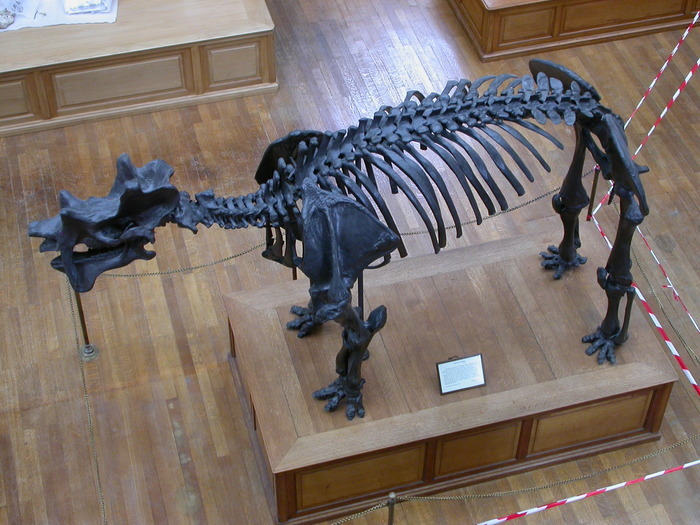 While the resemblence to elephants is obvious, it probably had a lifestyle and general appearence more like modern hippos or tapirs, with thick stubby legs and no truck (but possibly a flexible nose like a tapir). 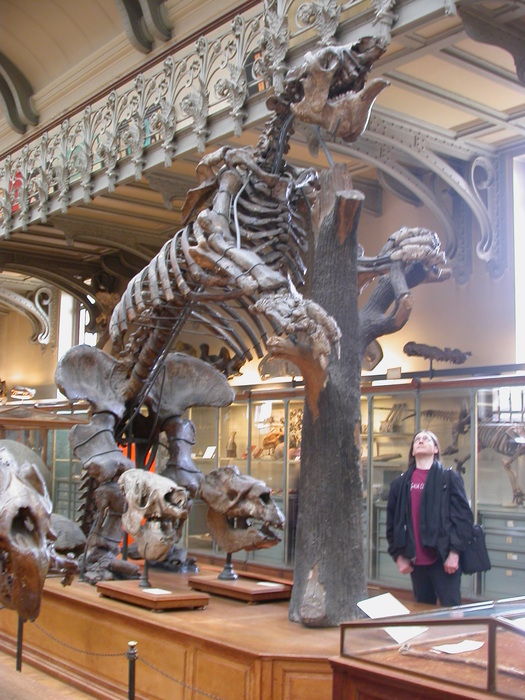 A closer look at the neighbor in the background of the last photo, Deinotherium. The skull suggests that this one did have a trunk like our modern elephants (although probably somewhat shorter), and was larger than modern elephants (closer in size to the mammoths). We aren't sure exactly how it used its downward-pointing tusks, which do seem rather less convenient than the upper-jaw tusks of the other elephant family members. 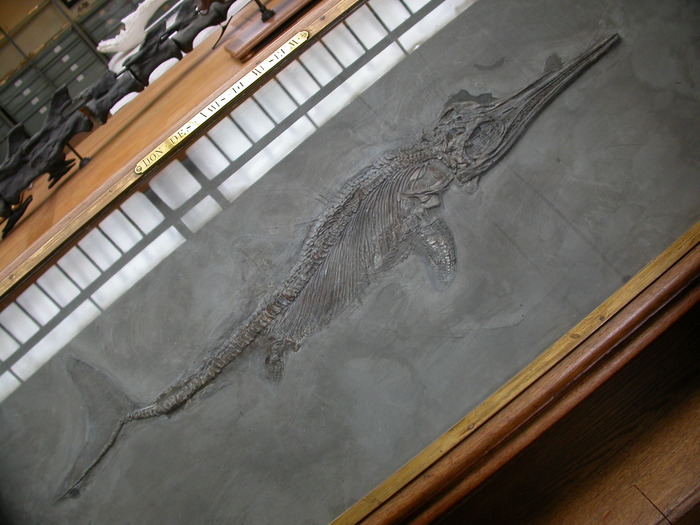 A beautiful fossil of an old friend, Ramphorhynchus. 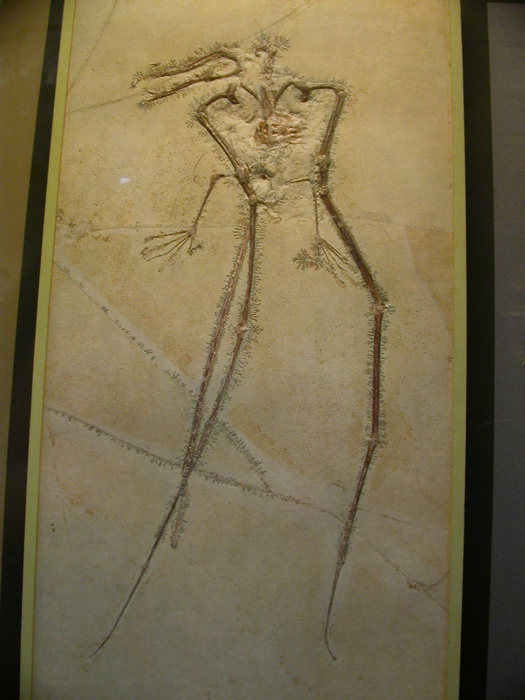 This was one of the pterosaurs, or flying dinosaurs. When I was young it was said that they were gliders and not true fliers, but the evidence that this is not the case is visible here: note the relatively heavy triangular bone in the center of the chest, between the two shoulders. This is a keel bone, and forms the attachment point for powerful chest muscles. There is no reason to have this if you aren't flapping. They also had hollow bones and an enlarged brain with enlargement in the areas which receive sensory information from the wings, and well-developed balance centers. A baby pterosaur. This fossil is about 10cm long. This deadly-looking beast is in the family tree of whales (note the drawing of them swimming around). This creature, about the size of a modern horse, probably swam like an otter - undulating its back and its long, thick tail. It probably hunted in shallow water like a crocodile, waiting for its prey to wade in for a drink or a bath and then striking from below. 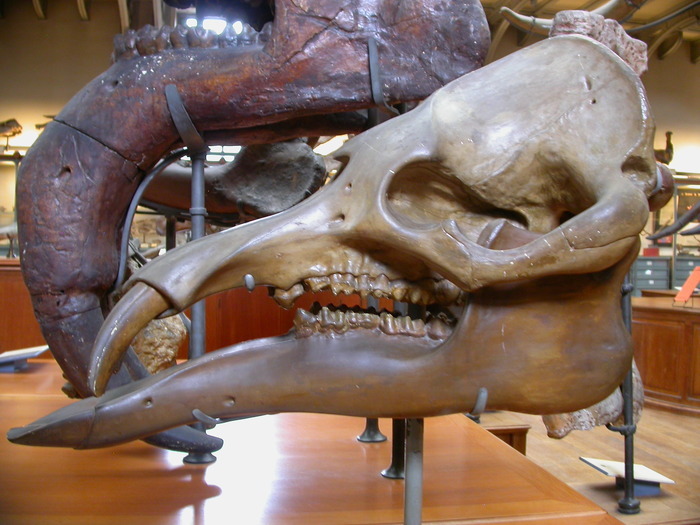 Its nose is somewhat elongated, but its nasal openings are located in the nose and not on top of the head as in modern whales. There is some debate as to whether whales arose from Mesonchids, a now-extinct order of hooved carnivores; Arteriodactyls, the same group which gave rise to hippopotomuses; or if they arose as a separate group from the common ancestor of the two, the order Condylarthra. Early whales have teeth similar to Mesonchids, but ankle bones (yes, ankle bones: these whales still had legs) similar to arteriodactyls. The whales distinctive ear bones first show up in Pakicetus, a long-nosed, long-tailed hoofed carnivore which may have developed its long nose for fishing, but was otherwise a land creature. Pakicetus also possesses whale teeth. This creature, being aquatic, is quite a bit closer to modern whales than Pakicetus. Eric providing scale with another old friend, the triceratops. The purpose of its horns and frill are in dispute - now thought to be primarily for courtship display. Part of the reason for this reasoning is that about half of the immature triceratops have thin spots in their frill... indicating that possibly as adults they become a Torosaurus, a creature with an enormous frill which has two large holes in it, presumably to offset the weight of it. 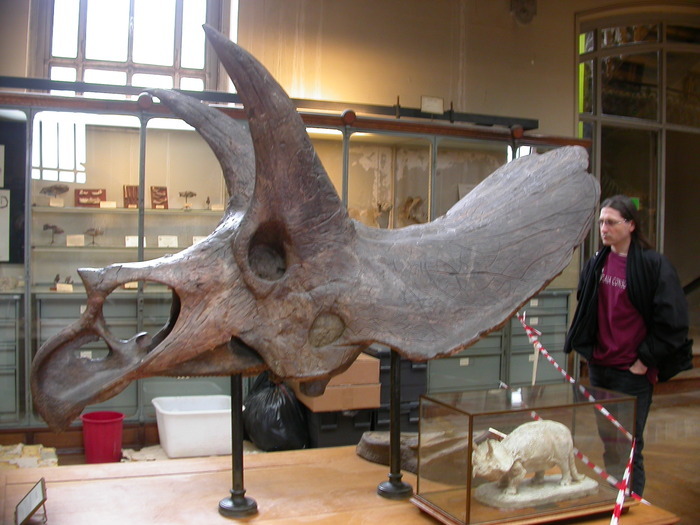 It is possible that Torosaurus actually represent adult male Triceratops, although since some adult skulls have been found without holes, probably not all Triceratops formed them. Torosaurus also have horns that point more outward than forward. While scarred frills and broken horns have been found, they are not very common, implying that if the triceratops did use them for defense it didn't have to do it very much. Then again, even a Tyrannosaur might think twice about taking on an armored creature the size of a city bus. Triceratops and its relatives were one of the most successful dinosaur species, constituting about 5/6 of the large dinosaurs around at that time. Does the mouth look rather parrot-like? The hips do too. Triceratops is in the group Ornithischia, the bird-hipped dinosaurs. Another old friend, the ichthyosaur. The ichthyosaurs were reptiles, but completely adapted to life at sea. You can see the soft-tissue shadow of its tail fin and dorsal fin. 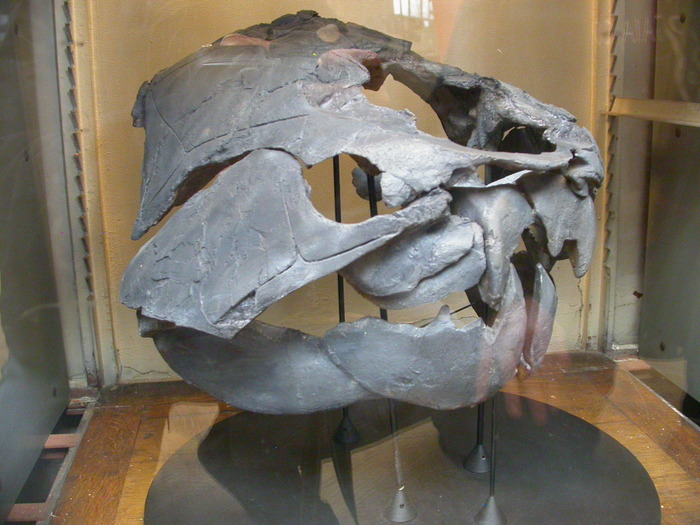 You can also see the enormous eye socket, implying that it hunted mainly by sight. Some have been found with babies inside, distinctly lacking eggshells, showing that ichthyosaurs gave birth to live young (as do some species of snakes and a few other reptiles today). This adaptation probably allowed the ichthyosaur to give itself entirely to its oceangoing lifestyle. 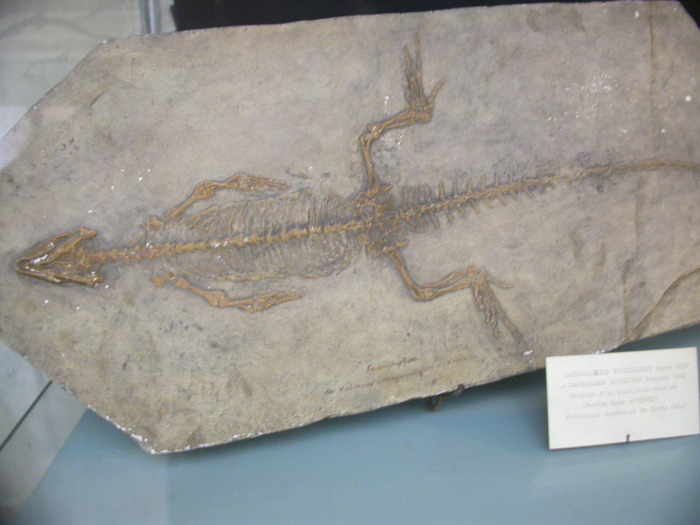 A similar skeleton is labeled Mystriosaurus laurillardi , apparently indicative of some early confusion about the group. 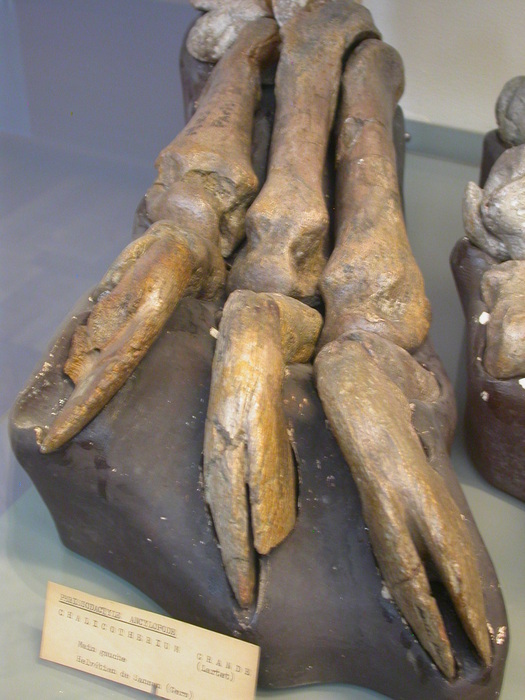 While not as nicely preserved, and definitely more difficult to photograph, our mysterious friend may have something a lot more like forelegs than the distinct flippers of the ichthyosaur. 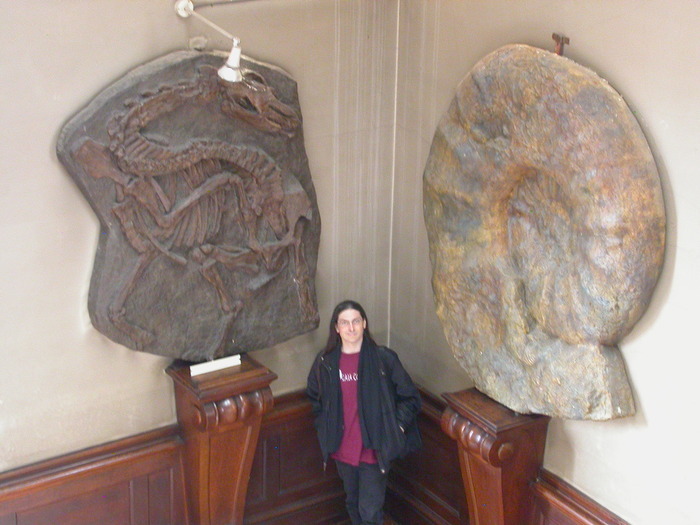 Yet another old friend, a Plesiosaur (aka Cryptoclidus oxoniesis or, if you prefer, the Loch Ness monster). 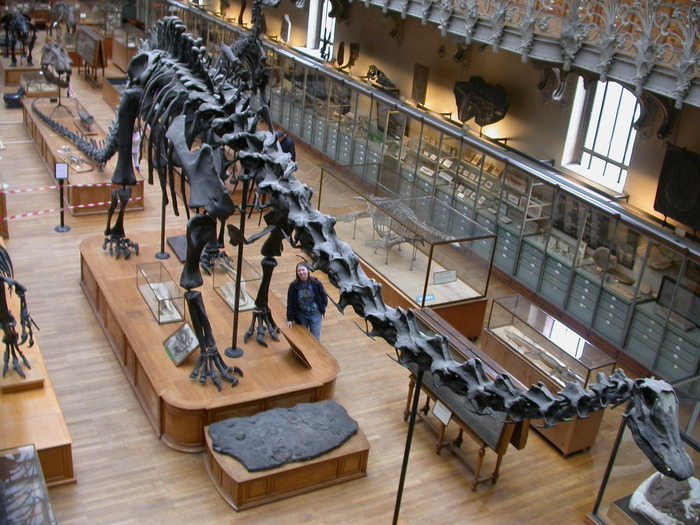 This one is rather small; the species can grow up to 8 meters long, which is quite medium-sized as plesiosuars go. Little is known about their lifestyle. They posessed about 100 fine teeth (not preserved here) which may have been used to grab slippery fish and squid, or may have been used to filter shrimp from the sea. They may have come up on land to lay eggs, much as seals and turtles reproduce on land today, or they may have been entirely oceanic. Although they lived at the time of the dinosaurs, they were true reptiles (dinosaurs were not). It is not true that fish don't have teeth , but Dunkleosteus didn't, and didn't need them. Instead it grew bony plates which it used to hunt, and probably hunted anything and everything. This one is rather small at only about a foot tall, but it has a larger brother in the shadows behind me which stands at about a meter high. 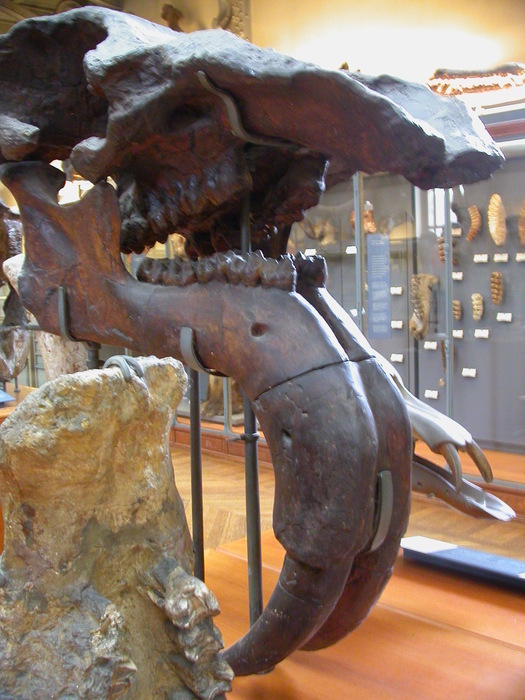 Bite marks on the bony plating of some examples indicates it was probably cannibalistic. It may have been outcompeted by the more agile sharks. 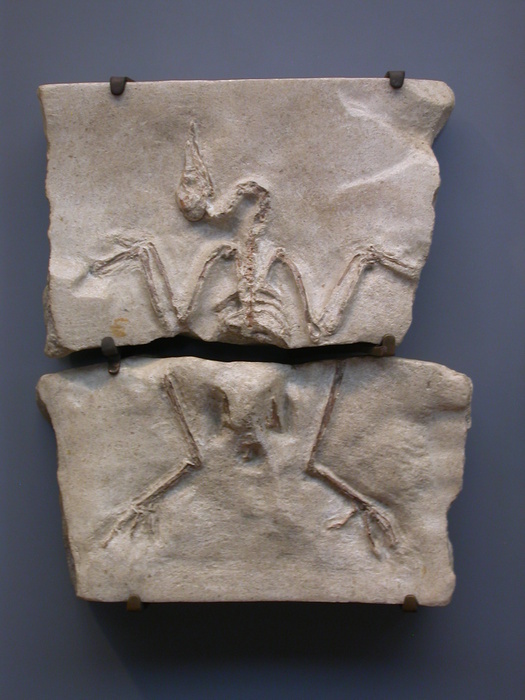 The first known true bird, Archaeopteryx. 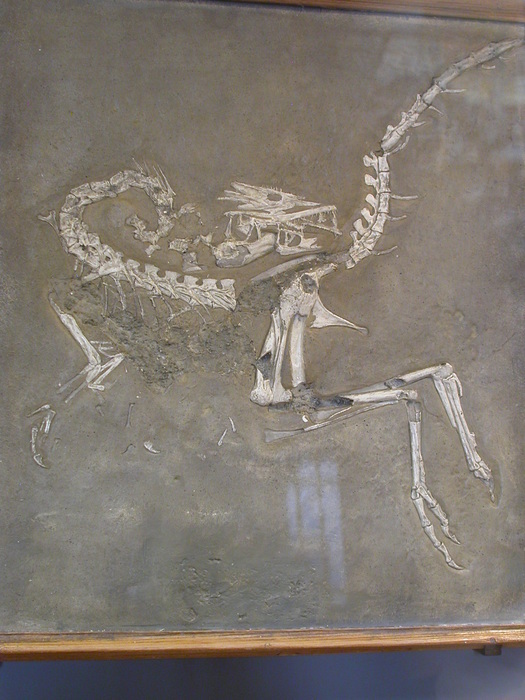 Archaeopteryx lived about 150 million years ago, in the middle of the age of dinosaurs. 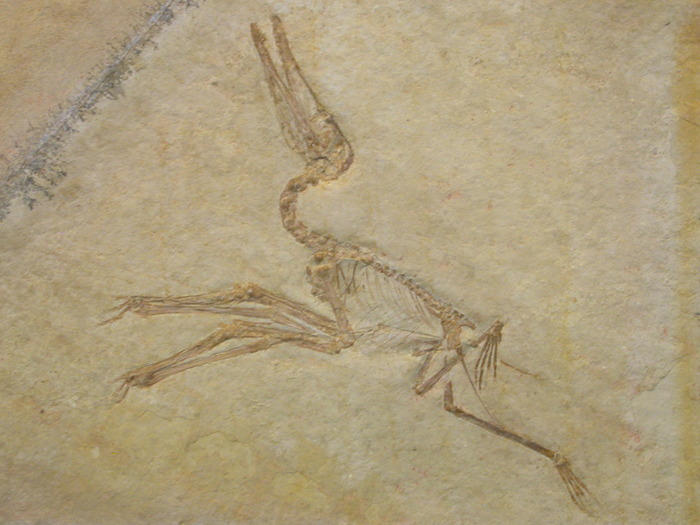 Fossils of Archaeopteryx are known from only one site, in Bavaria. The site where it was found preserves fossils remarkably well, and many have feathers. Aside from the soft impressions of feathers, it pretty much looks like any other theropod dinosaur, a group that includes most of the famous predators, such as Tyrannosaurus and Velociraptor. Evidence of feathers has been found with many other dinosaur species, although the oldest are only about 10 million years before the fully-flighted Archaeopteryx. 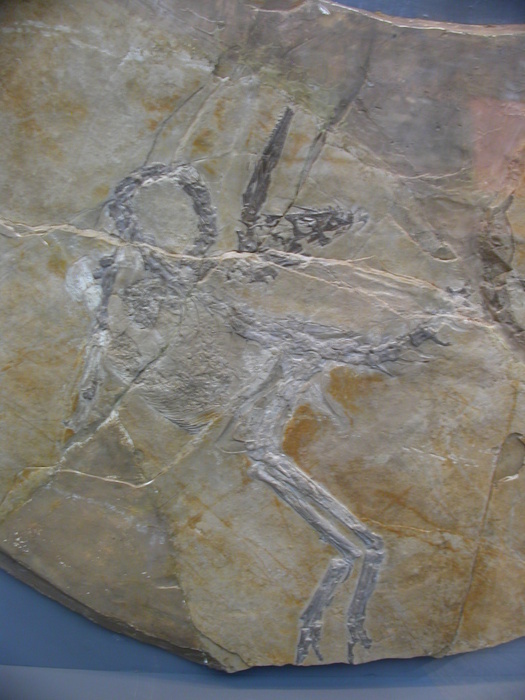 Ludiortyx hoffmanni, a bird not much different from today's fowl, which lived about 40 million years ago. 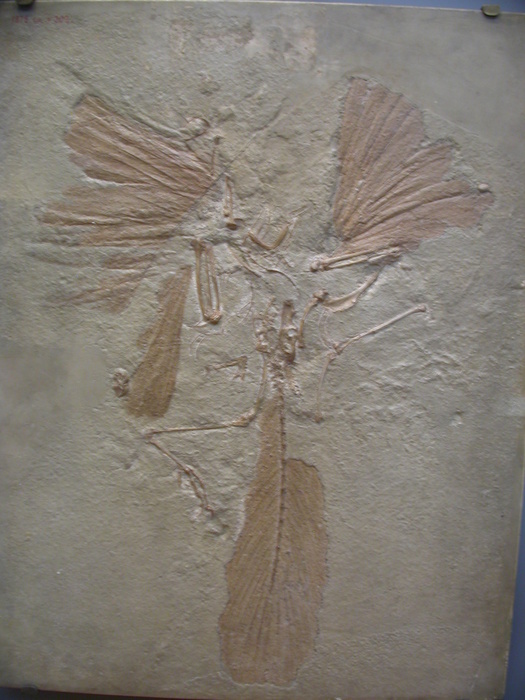 The genus (and probably this fossil) were discovered here in Paris. 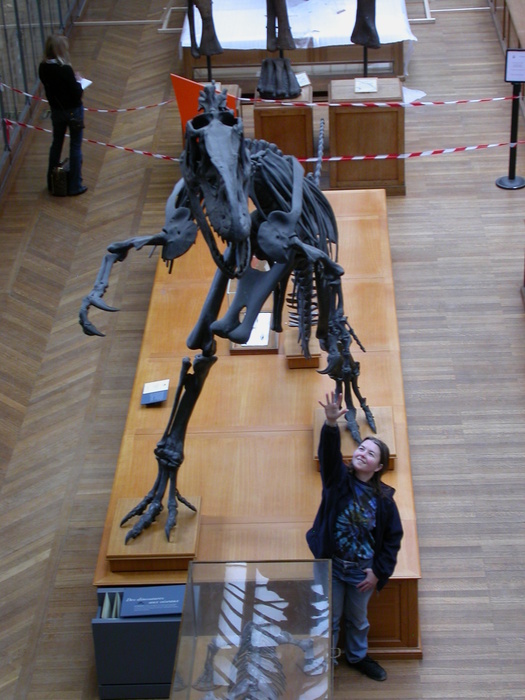 Compsognathus longipes is known from only two fossils: one found in Bavaria and another in France. This is the Bavarian one. The fossil gained some fame as the smallest known dinosaur, although the French example found 100 years later showed that the previous one was a juvinile, and adults grew to be about a meter long. 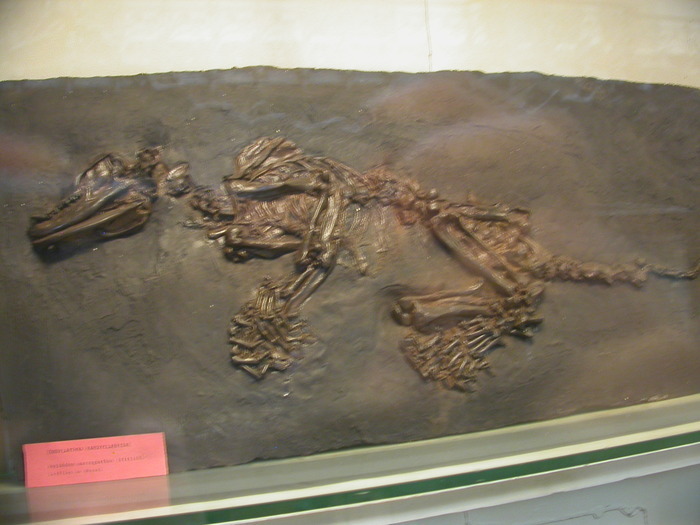 This one was found in the same fossil bed as Archaeopteryx and lived at about the same time, give or take a few million years. I believe this one is a Velociraptor. Back to the mammals: this is labeled Condylartha paroxyclaenidae, but either this is a very rare species indeed or, more likely, it has since been renamed. 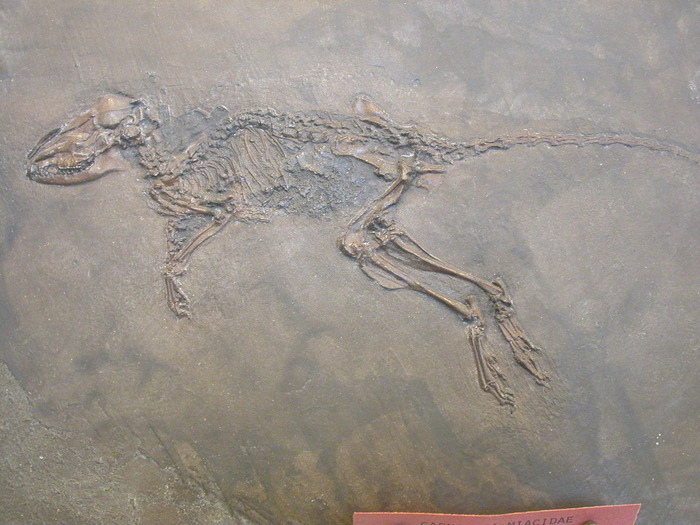 It probably is a condylarth, an order of early placental mammals dating back nearly 60 million years and surviving into the Eocene, the era of our small French bird above. This group were probably insectivores, but later become omivores and herbivores, giving rise to all of the hoofed mammals and possibly also the whales. I'm not sure exactly what this is. Its basic structure looks mammalian: it has a pelvic bone that looks like ours rather than a bird's, pronounced clavicles (collar bones), 4-5 weight-bearing toes on each foot, etc. (Compare this to the Velociraptor above.) The teeth are rather simple, but Mesonchid molars all basically looked the same, and this one has a distinctly larger carnassial tooth (the big molar second from the back). So I would guess this is an early example of Carnivora, with the teeth not quite so specialized as they are today. 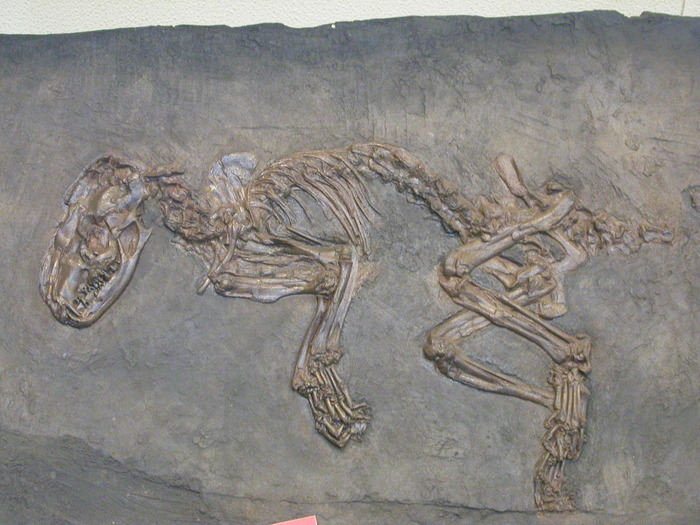 The label says Carnivora miacidae, making this a Miacid, considered the ancestor of the order Carnivora (our modern cats and dogs). This particular one was only about the size of a rat, and probably looked something like a fisher or martin. Note that its molar teeth are all about the same size, although the middle one is slightly larger: starting down the path toward differentiation into the Carnivora which outcompeted the Mesonchids in the Eocene. 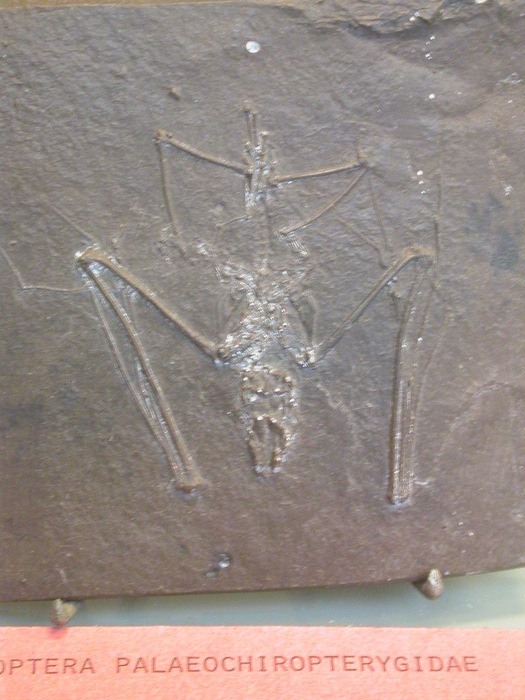 Chiroptera paleochiropterygidae, an ancient bat. 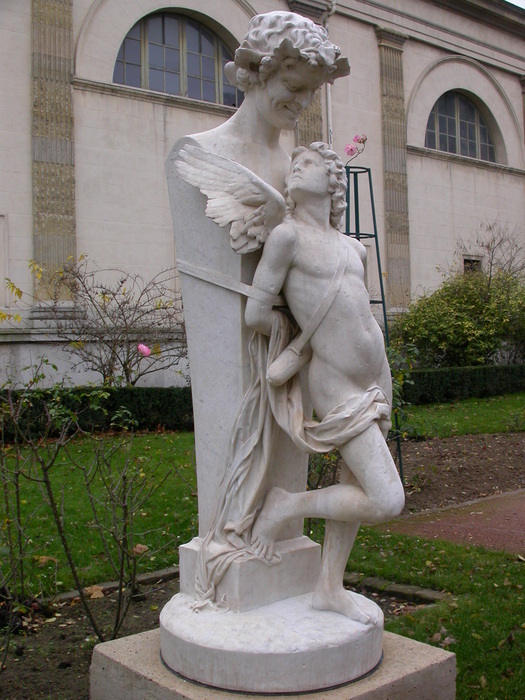 Note the somewhat longer rear legs (the top ones in this photo) compared to the modern bat (above). The femur of this bat is about 2/3 the length of the humerous, compared to about 1/2 the length in the modern bat. Bat fossils are rather rare, because they have such tiny bones and normally do not expire in good fossil-forming ground, such as silt. Now *that* is an ammonite! My turn to provide scale: keeping the Diplodicus company. 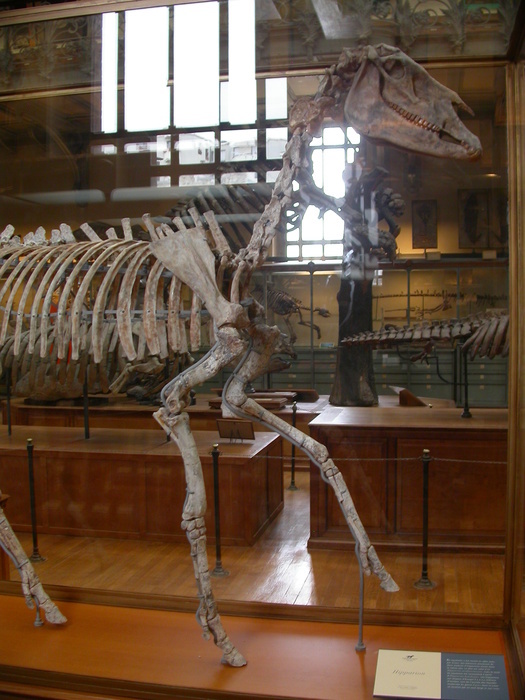 This is one of the few Diplodicus skeletons still mounted as it was in 1908: a bit of history within history. Allosaurus fragilis was an 8 meter tall carnivore which lived in what is now the western United States during the late Jurassic (about the same time as Archaeopteryx was flying around primordial Germany). It was smaller and probably slower than Tyrannosaurus, suggesting it was an ambush hunter. Young Allosaurs have longer legs though, implying that perhaps the young ones tended to run more for their prey. Allosaurus bite marks on fossil steogsaurs, and stegosaur spike wounds on fossil allosaurs, prove that allosaurs at least tried to make stegosaurs a part of their diet. Another beast you wouldn't want to meet in a dark alley. 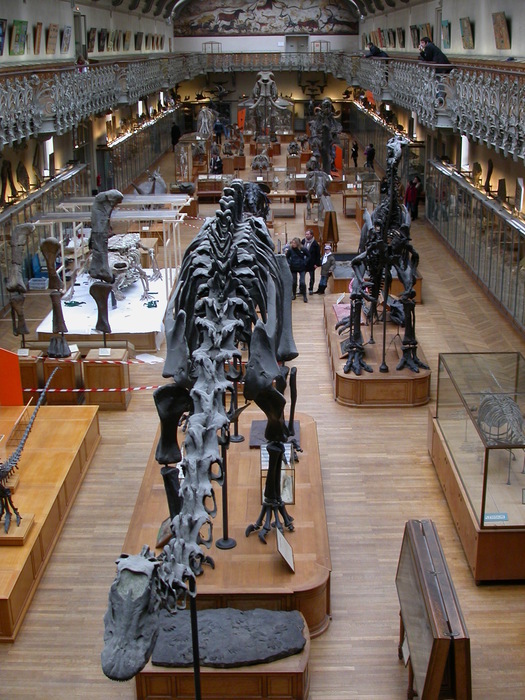 They have assembled a complete skeleton made of clay parts, and are one-by-one replacing the clay bones with the real ones in order to put the fossil on display. I'm not sure exactly what this beast was (the sign wasn't up yet), but that it was large and reptilian is quite clear. This is a weird bone. First of all, it's big. 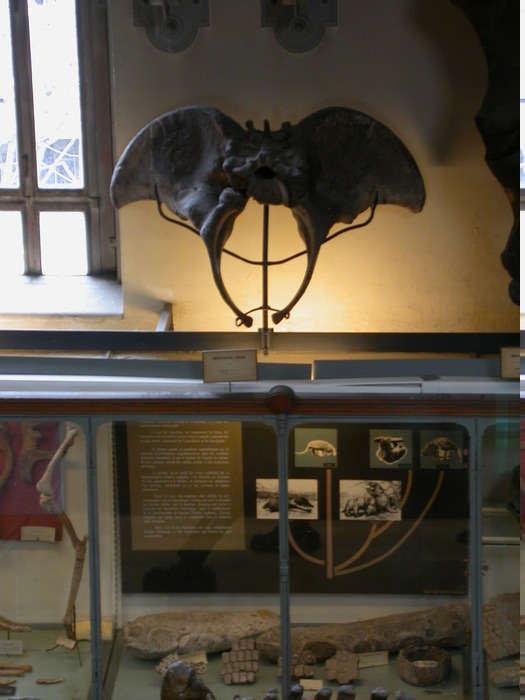 Second, it has these giant wings, which makes it probably either an ischium (pelvic bone) or an atlas (neck bone). If it's a pelvic bone then the leg bones below it are really very small. If it is an atlas than the whole thing is terrifyingly large. Looking down on the giant sloth. Imagine something the size of a rhinocerous with giant teeth like a saber-toothed cat and six horns on its face, and you have a Uintatherium. It was, fortunately, a herbivore, and lived in the middle Eocene (about 40 million years ago). 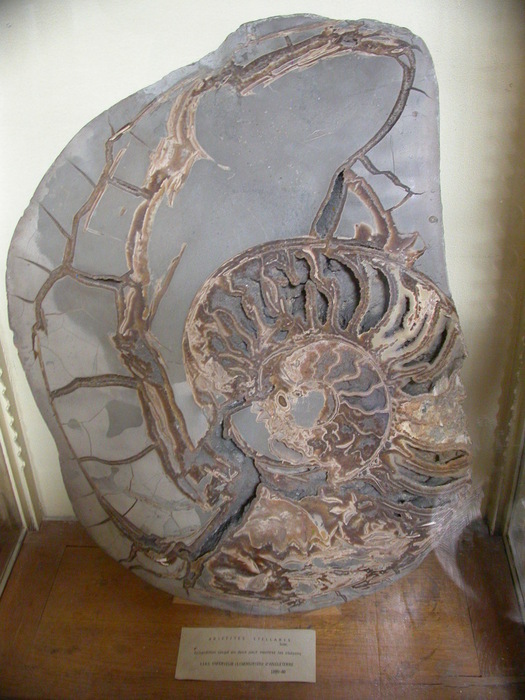 A more normal-sized ammonite, but showing the complex linkage of its shell. Ammonites lived in the oceans in the Jurassic, Triassic, and Cretaceous geological periods (250-65 million years ago). 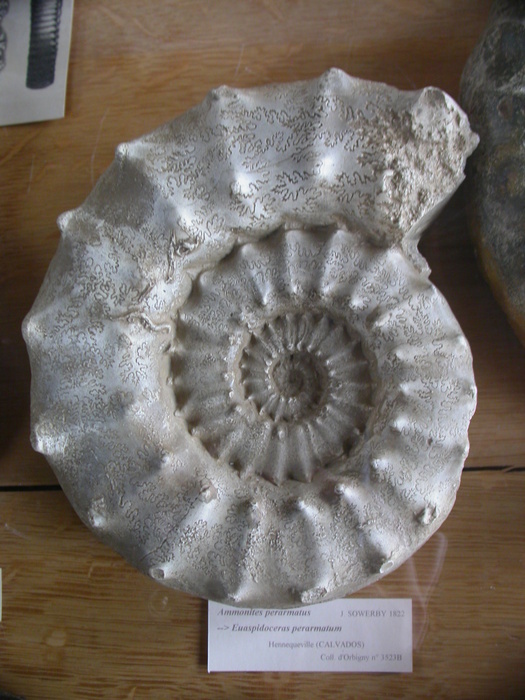 Different types of ammonites were common at the different times, and thus are used as a kind of geological clock. 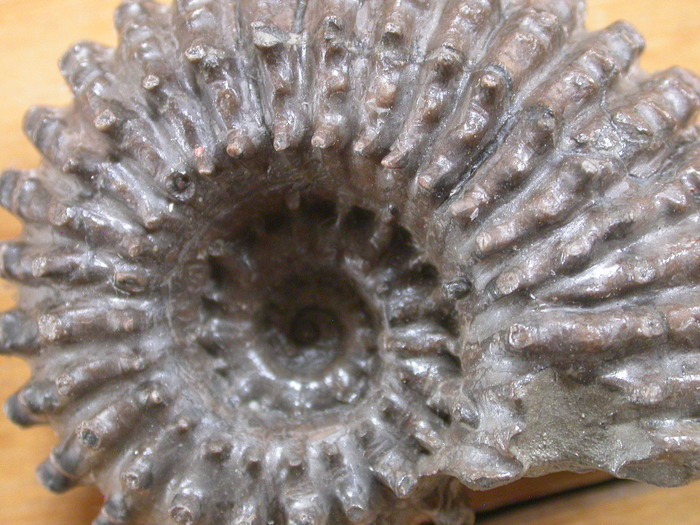 Ammonites were related to modern squids; some have even been found with fossilized ink. They are thought to have lived mainly in the open ocean, filling up some of the chambers of their shell with air for buyancy. They were hunted by mososaurs and other giant reptiles: teeth marks have been found on some of the shells. A well-preserved little lizard with a not particularly well preserved name plate. 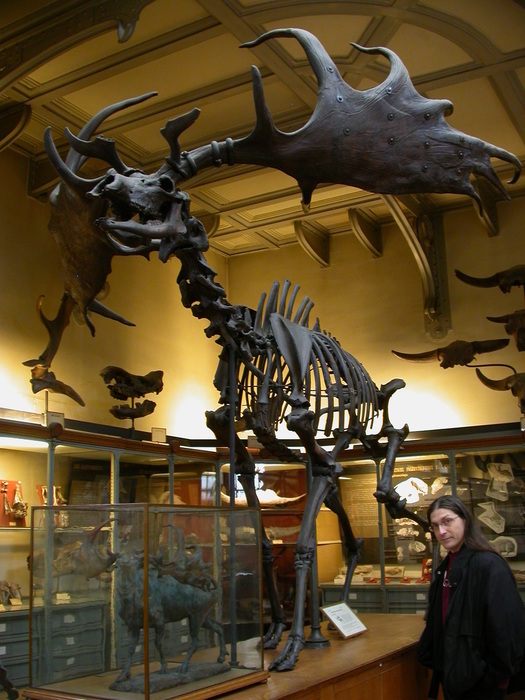 One very large deer, the Irish Elk. These survived until about 7000 years ago, or about the time that people were first erecting menhirs, or standing stones, in England and northern Europe. 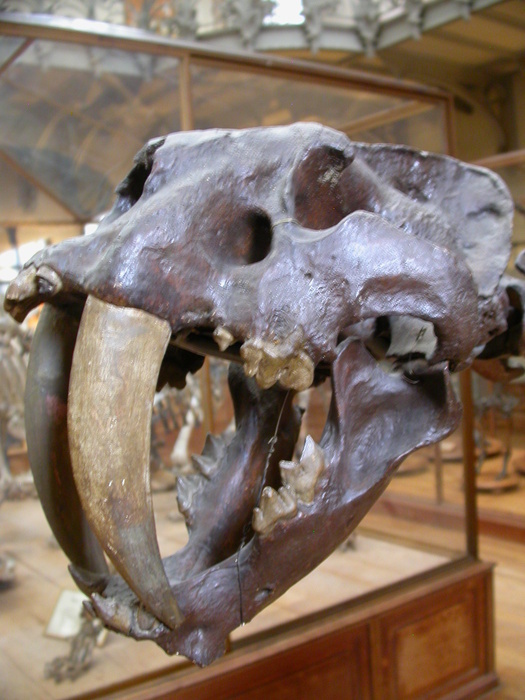 A saber-toothed cat. Note the frill of bone at the back of the neck. 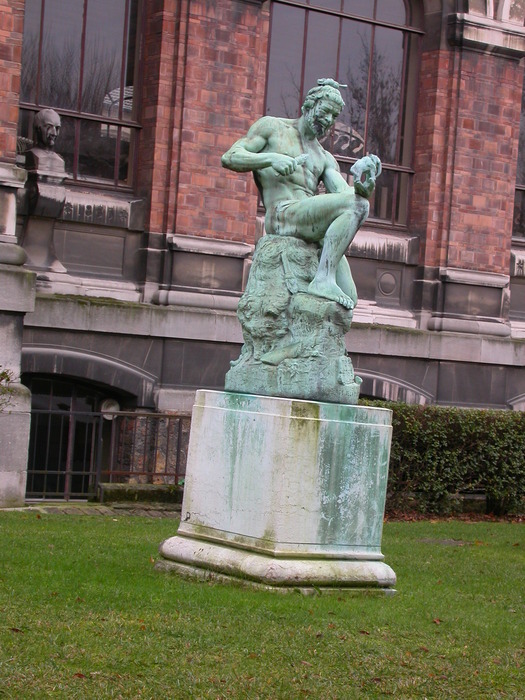 This would support the attachment of powerful neck muscles, which in turn supports the idea that the neck muscles (rather than the jaw) powered the saber-tooth's bite. 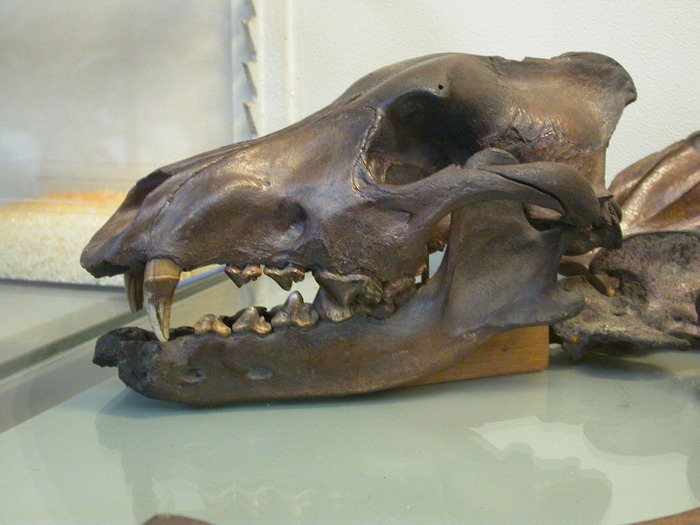 The skull of a dire wolf. 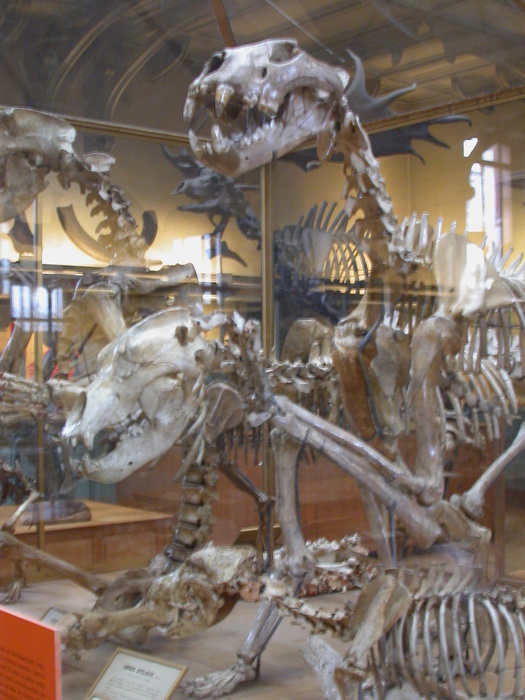 Dire wolves were somewhat taller than modern wolves, and somewhat bigger (90 kg or 190 lb on the high end). They had larger teeth, implying a more carniverous diet than modern wolves (which are very much opportunists and omnivores). Dire wolves lived in North America until about 10,000 years ago. Lions and dogs and bears! And glare, unfortunately. The canine is on the bottom (it might be a wolf but the shot is not good enough to tell), the bear is in the middle, and the lion is at the top. Eric next to a giant wombat. 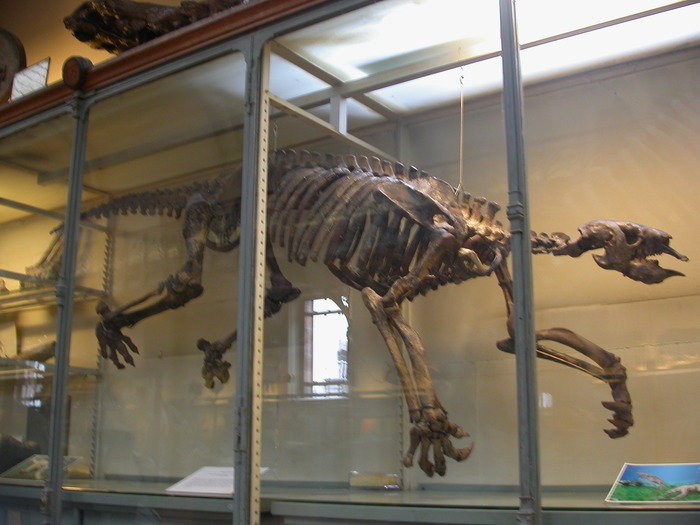 It's called a Diprotodon, but it was a marsupial (the biggest they ever got, as far as we know) and was, ecologically speaking, basically a big wombat. Finally, more weird art. Unidentified ape throttling unidentified savage. This has never happened and never will. The pattern of oxidation makes this look more like he's eating a very messy pomegranite than carving something. 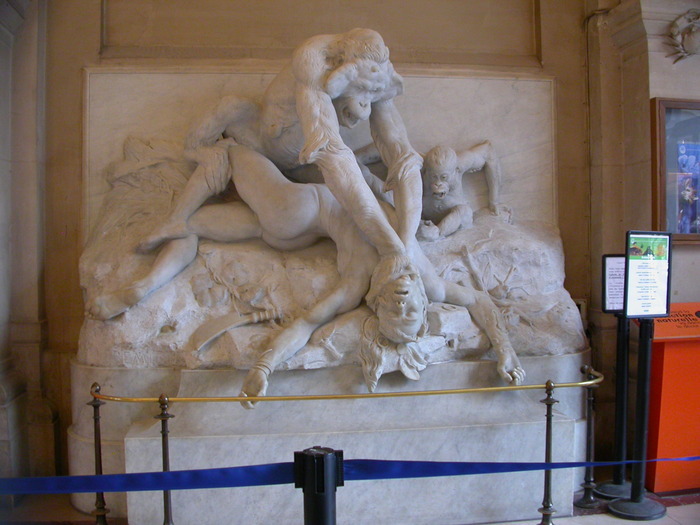 And I'm not even going to say what this looks like. Especially if you know anything about herms.